After the long interplanetary cruise from Jupiter the Cassini-Huygens spacecraft will make a rapid flyby of the moon Phoebe on 11 June 2004. This flyby will bring the spacecraft to within 2000 km of the surface of the moon and is the only chance the spacecraft will have to image in high resolution an outer moon. During the rapid flyby Cassini collected spectroscopic and radar data along with images of the surface. This information can help scientists understand the composition and origin of this distant moon. The data showed evidence of an icy moon covered with darker material. 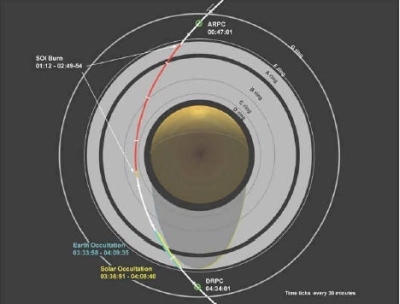 Following the flyby a trajectory correction manoeuvre was made on 16 June 2004 to place the Cassini-Huygens spacecraft on a precise intercept course with Saturn. On 1 July 2004 the Cassini-Huygens spacecraft arrived at Saturn. This marked the end of the spacecraft's journey through the Solar System as well as the beginning of its tour of Saturn, its rings, moons, and magnetosphere. During the Saturn Orbit Insertion Cassini-Huygens approached Saturn from below the ring plane. The spacecraft crossed through the large gap between the F-Ring and G-Ring. At the time Cassini-Huygens was 158 500 kilometres from Saturn's centre. This crossing occurred one hour and 52 minutes prior to the spacecraft's closest approach to Saturn. The main engine burn began shortly after Cassini-Huygens crossed above the rings on 1 July 2004 at 01:12 UTC and ended 97 minutes later at 02:49 UTC. In order to slow the spacecraft significantly enough to be captured by Saturn's gravity, Cassini's main engine was turned to face the direction of travel. The resulting thrust from the engine acted as a braking device, slowing down the spacecraft as it entered Saturn's orbit. Cassini-Huygens' closest approach to Saturn, during the entire four-year tour, occurred during this burn. The spacecraft's distance from Saturn was approximately 0.3 Saturn Radii (20 000 km). Cassini-Huygens continued to coast above the rings for approximately one hour and 44 minutes before its descent back through the ring plane. The Saturn Orbit Insertion (SOI) burn was critical to the success of the mission at Saturn. The spacecraft's close proximity to the planet and its rings provided a unique opportunity for an in-depth study of the planet, by utilizing the appropriate instruments onboard the spacecraft to conduct studies in waves, particles and imaging data. The first column indicates the absolute time (in Universal Time) at which the event happened. The second column indicates the time the event was recorded on Earth. There is an 84 minute difference between the actual event time and the recorded event time due to the distance between the Earth and Saturn.